Report by Mary Geraghty/Margot Hughes. 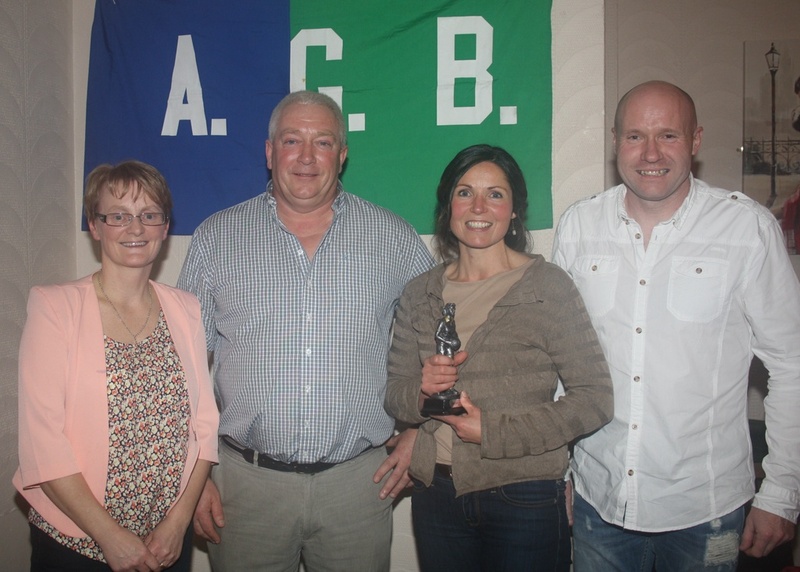 The AGB Ladies players, coaches and administrators gathered in the Harbour Bar on Saturday, November the 8th, 2014 to celebrate another enjoyable and eventful year of football. Chairman Mick Healy initiated proceedings by thanking all the players, coaches and admins for their hard work throughout the year. He also thanked all who supported the club, particularly the many sponsors that helped throughout the season. He then presented the ladies of the committee with beautiful bouquets of flowers. 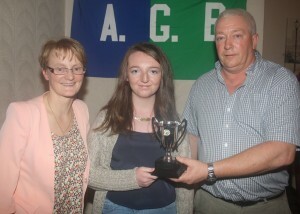 The U16 Player of the Year Trophy was presented to Kayleigh Earls by Margot Hughes and Mick Healy. Kayleigh was praised for her dedication to her team and her effort both at training and at matches. Kayleigh also participated on both the Minor and Junior panels and was an influential player on these teams also. The U16 team reached the championship final this year but lost out to St. Pat’s. 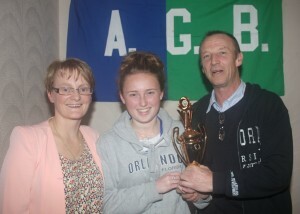 Aoife O’Reilly, a very talented young player whose dogged determination inspires her team-mates. Like Kayleigh, Aoife is also a strong U16 and Junior footballer. The Minors, unfortunately, had very little football in 2014. They had a very close encounter with Bray in the Shield Final but unfortunately had to relinquish the Shield which they had held for the last two years. The Junior ladies were narrowly beaten in the Junior A semi-final by St. Nicholas’. Team manager Stuart Gleeson praised the hard work of all the Junior ladies. He presented the ‘Junior Player of the Year’ award to Ger Galvin, praising the example she presented to the younger Junior players, her positivity and her mentoring. Ger consistently put 100% into her performances, both at training and at matches. Garry Hurley then announced the ‘Senior Player of the Year’ which went to Áine Byrne in appreciation of her leadership on and off the field of play. The Senior ladies won out the Combined Cup, beating Valleymount, and then went on to reach two other finals, the Leinster Senior League where they were defeated by Sarsfields Ladies, and the Championship final, where Baltinglass came away victors on the day. Finally the ‘AGB Ladies Club Person of the Year’ award was presented to Mick Healy for his long years of dedicated service to the club. Margot Hughes and James Furlong presented the award. Margot couldn’t praise Mick highly enough and remarked on how much easier he made all committee member’s roles with his much appreciated words, ‘Leave it with me’. With so many dedicated volunteers that regularly work way beyond the call of duty this truly is a coveted and much appreciated award and no one deserved it more than Mick. He has served for three years as Chairman of the present committee and has served on many committees over the years. He always has the best interests of the club and the players at heart and leaves no stone unturned to facilitate the participation of as many players as possible within AGB. He will be missed as Chairman next year but we know he will still remain a very dedicated and supportive member of our club. 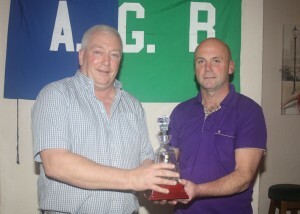 Jimmy Dunne, AGB Executive Secretary, congratulated Mick on his award and commended the Ladies on their efforts for AGB. He praised the organisation and commitment of all involved with the ladies section of the club. The number of calls he regularly received to check on the availability of the pitch at Pearse Park spoke volumes about the amount of football played throughout the season by all age groups in the ladies section. He also noted that every time he happened to be down at the park, which is quite often, there were always groups of girls either training or playing games and it was a great source of encouragement to the club to see this effort in action. He proclaimed the ladies an example to all of hard work, commitment and dedication to the game of Gaelic football. The Senior ladies Combined Cup may have been the only trophy on the table at this year’s presentation but the enjoyment of football and friendship of the Ladies members has been the most valuable prize of 2014. Well done to all the players, admins, coaches, parents and volunteers for their effort and commitment to AGB Ladies in 2014. Closing the formalities on the night, the Chairman and Secretary called on all members to attend the upcoming AGM and to continue to share in the successful running of this growing club at Arklow Geraldines Ballymoney.